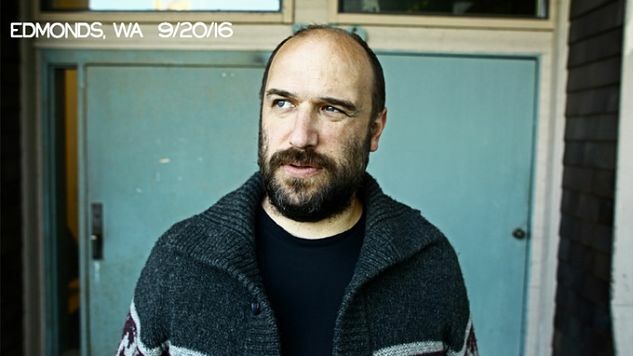 Director Brandon Vedder has spent the last two years following singer-songwriter David Bazan on tour, working to craft a documentary telling his story. That story is certainly one worth telling, as Bazan’s journey from “indie/Christian crossover act” with his band Pedro the Lion to an alienation of that fanbase once he began questioning, reevaluating and ultimately abandoning his faith raises many interesting questions regarding both the independent and intersected worlds of music and faith. The documentary mixes one-on-one conversations with footage from Bazan’s living room tours, where he invites fans into “no-holds-barred Q&A sessions,” and takes him through the releases of his two latest albums, including the excellent Care, which was released last month. Vedder is now in the final days of a Kickstarter campaign to help fund the documentary, which is moving on to the post-production phase and is titled Strange Negotiations. While he and the film’s producer, Alison Mo Massey, just recently reached their minimum goal of $75,000, any additional support will grant them “more freedom and time to achieve the best version of this film,” and will help them “to invest in the crucial marketing and PR necessary to get the word out.” The campaign is scheduled to end later this week, early in the morning of Thursday, April 6. Like any good Kickstarter, donations come with some exclusive perks, which include T-shirts, tote bags, posters and a live EP from Bazan’s living room shows. If you’re particularly invested in the film, a $1,500+ contribution will earn you lifetime access to any Bazan show. Judging by the trailer, which you can watch below, Strange Negotiations isn’t quite setting out to be a traditional music doc—though it will feature music, along with discussions on the loneliness of a life on the road—but rather a film that seeks to pose important questions about religion and belief, along with the general polarized state we live in. Find the Kickstarter here and read two Paste features from within the midst of Bazan’s difficult transitional period: an interview from 2009 here and a lengthier 2014 piece here. You can also find a video of Bazan playing a set at Daytrotter last summer further down via the Paste Cloud.